When summer arrives, our air conditioners need to work overtime to combat the hot temperatures. But an overworked air conditioner can spell disaster for your repair bills and your home’s comfort. To avoid those costly repairs and getting stuck in the heat, it’s important that homeowners keep their AC in tip-top shape all summer long. If you’re looking for some help with keeping your air conditioner well maintained and running smoothly, we gathered the ultimate list of must-know air conditioning tips for you. Read our tips below to keep your AC from breaking down, avoiding an expensive air conditioning repair visit. 1. Get the power going. Prior to starting your air conditioner after a long period of inactivity, turn on the power to the unit for at least 24 hours before actually using it. This allows your air conditioner and its components to “warm up” before putting it into action, and skipping this step could accelerate any potential issues with your unit. 2. Keep your air conditioner on during extremely hot days. Many people believe that turning their system off while they’re at work or out of town is the best way to save energy and money on super hot days. However, this can actually be less efficient if the outside temperature is above 78 degrees. Objects and furniture in your home will retain heat on hot days when your air conditioner is off. As a result, it’s going to take more energy and effort for your air conditioner to cool your home back to something comfortable. We suggest setting your thermostat up three or four degrees when you’re not at home, rather than turning it completely off. If you want more ideas for saving money on energy bills in the summer, read our tips for efficient air conditioning. Plus, cycling your air conditioner on and off frequently could potentially damage your air conditioner, meaning a broken air conditioner on a hot day. 3. Remove the air conditioning cover when in use. Covering your air conditioner during the off season is great for protecting it against the elements. However, covering it while it’s operating will hinder efficiency—and could even lead to a breakdown from overheating. Make sure your cover stays off of your AC unit once you’ve turned it on for the season. 4. Clean or replace your air filter regularly. Your air filter is there to catch nasty particles before they make it into the air or build up in your system. But when your air conditioner is under heavy use, dirt and debris builds up much faster, which can affect your units efficiency and integrity. Check your filter at least once a month to make sure it’s clean and change it if necessary. If you need a little help changing your filter, read our post Air Conditioning Filters: Everything You Need to Know. 5. Avoid power washing your air conditioner. Power washing your air conditioner could cause damage to your coil or other parts and lead to a breakdown. Instead of reaching for the power washer, there are better ways to clean your unit safely. The Family Handyman has a great step-by-step guide, and the chore should only take about an hour to complete. 6. Inspect and clean your air conditioner unit. Speaking of cleaning, don’t forget to clean the area surrounding your unit of excess debris. In addition, clear the evaporator drain by removing the trap, flushing it with water, then putting a teaspoon of bleach in the trap to clean it. It’s also a good idea to check the fan blades to see if they are missing screws or have been damaged. Tighten any loose screws you find with a screwdriver to make sure they are secure. 7. Leave air conditioning repair to the professionals. 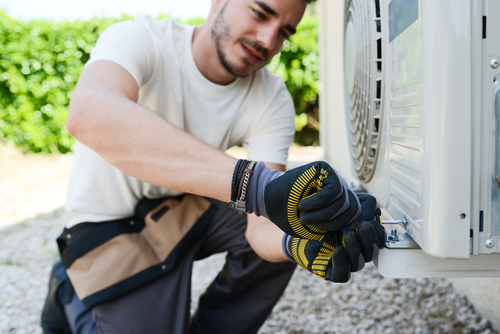 While there are many air conditioner maintenance items you can do yourself, others may require the help of a professional. Or worse, you may do more damage if you attempt a repair on your own. If you have a question regarding the maintenance of your AC system, check out our post 5 Commonly Asked Air Conditioning Repair Questions, which features tips that can help. If you’re in doubt, call a professional HVAC repair company. Keep your home cool and your air conditioner operating smoothly with the below air conditioning tips for hot weather. 1. Provide good air flow to outdoor equipment. Have a lot of landscaping near your air conditioner? Plants can block airflow and decrease your AC system’s efficiency, putting your home’s temperature at risk. A good rule of thumb is to keep your plants at least two feet away from your unit to avoid any blockages. However, if your plants are already placed, in our spring cleaning checklist we suggest that you trim any shrubbery to allow for at least two feet of clearance on all sides and five feet on the top. 2. Shade your indoor windows. The Georgia Environmental Facilities Authority reports that up to 20% of your air conditioning bill can be attributed to sunlight streaming in through unshaded windows. Keep your curtains drawn during the day to block sunlight — particularly east- and west-facing windows — and your air conditioner won’t have to work nearly as hard to keep the temperature down. 3. Reduce moisture levels inside. By reducing moisture levels inside, you can not only increase comfort, but reduce the amount of work required by your air conditioner. Much of the excess moisture inside of your home comes from outside humid air creeping in, so spend some time finding and sealing any sources of air leaks. Or, opt for a whole-home humidifier. 4. Invest in a new, high efficiency air conditioner. Newer air conditioning systems are more efficient than their older cousins, meaning they are more effective at cooling homes. If your air conditioner is more than 10 years old, you may want to consider upgrading to a new air conditioner with a high Seasonal Energy Efficiency Ratio (SEER). The Department of Energy recommends Energy Star units with a SEER rating of 14.5 or higher. 5. Install a variable speed air handler. 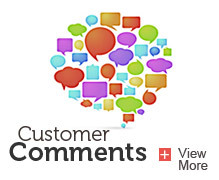 The air handler is the part of the AC that’s located outside of your home. If you want to improve your system’s ability to cool your home, you may want to explore the benefits of a variable speed air handler. This device allows your system to operate more efficiently by gradually ramping the energy feed up and down, thus using less electricity. 6. Open your vents, registers, and doors. While it may be tempting to close off vents or registers to try and regulate your home’s temperature, closing them can actually cause efficiency issues and make it harder on your air conditioner. Your central AC should be properly sized for the square footage it needs to cool, so let it do its job. If you want more control, consider adding a zoning system. By following the above air conditioning tips, you can avoid costly air conditioner repairs and keep your home cool. If you still aren’t able to keep your home cool after following the above tips, however, it may be time to call in some professional help. 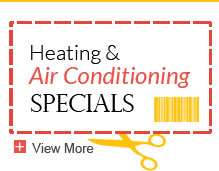 Give us a call or contact us to schedule an air conditioning maintenance visit so we can help you beat the heat. 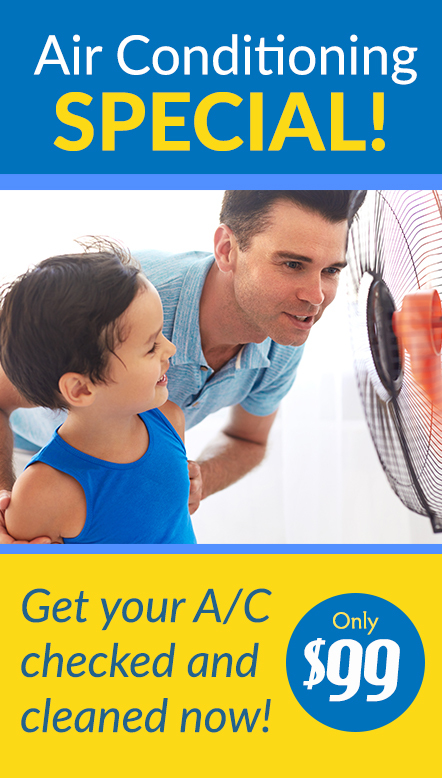 Looking for air conditioning tips that can help you save? Check out our tips on how to reduce air conditioning costs.